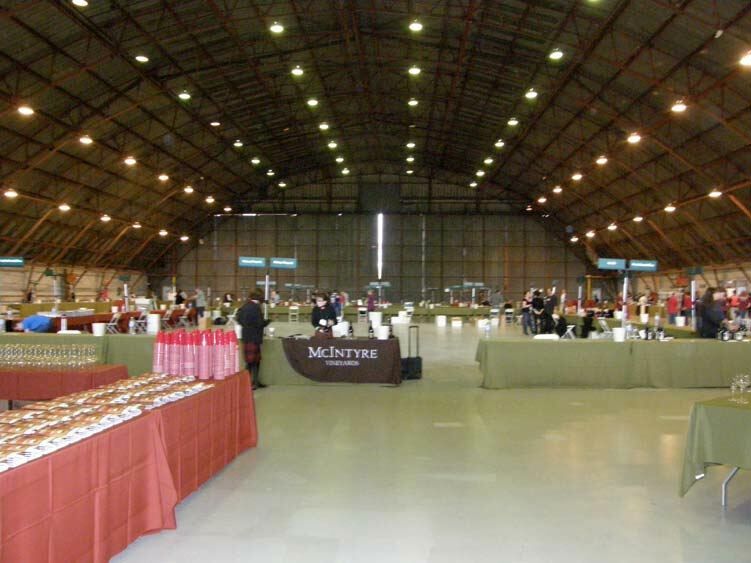 The inaugural Pinot Days Southern California 2010 kicked off the Pinot Noir event season in the U.S.. About 2,200 trade members and consumers and 95 Pinot Noir producers attended the well-organized celebration of Pinot Noir in Barker Hanger at the Santa Monica Airport. The organizers, led by Steve and Lisa Rigisch, plan to make this an annual event. I only sampled some of the wines offered, but did come away with some impressions and a few wines that particularly stood out. 1. The three best wines I tasted were all 100% whole cluster: 2007 Native 9 (Rancho Ontiveros), 2007 Tantara Solomon Hills Vineyard, and 2007 Windy Oaks Estate Whole Cluster. Many Pinot Noir producers are now experimenting with whole cluster fermentation. Traditionally, red wines are crushed and de-stemmed before fermentation. Whole cluster fermentation refers to a fermentation of intact clusters as picked from the vine with no intervention of machines leaving the whole berries and stems intact. Stem retention may vary from 10% to 100% depending on the vintage, region and producer. I plan to present this subject in much greater detail in an upcoming issue. Stay tuned. Suffice it to say, whole cluster fermentation can add desirable aromatics, flavors and tannic structure to finished wines. 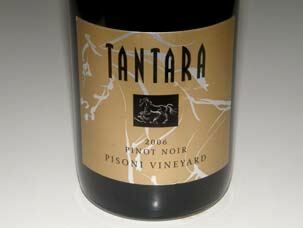 I have found that Pinot Noirs with whole cluster inclusion can be exceptional. 2. The winemaking mantra for vinifying premium Pinot Noir has been the use of some percentage of new French oak in the aging process. Oak can add subtle aromatic and flavor enhancements as well as contributing tannins to the finished wine. However, oak barrel aging can be overdone, robbing the wine of fruit expression and obscuring the delicate nuances that make Pinot Noir so alluring. To avoid this potentiality, some producers are severely limiting or abandoning the use of new French oak barrels. One such producer is winemaker and owner Phillip Baxter, Jr., of Baxter Winery in the Mendocino Ridge AVA of Mendocino County. At Pinot Days, he was pouring three of his latest releases, all crafted in neutral oak barrels. The 2007 Toulouse Vineyard (Anderson Valley), 2007 Red Dog Vineyard (Anderson Valley), and the 2007 Oppenlander Vineyard (Comptche, Mendocino County) Pinot Noirs were bright and fresh and pure, unadulterated expressions of Pinot Noir. The Toulouse offered an attractive richness of flavor with impeccable balance, the Red Dog had bright acidity and a memorable finish, and the Oppenlander was dark and earthy with a healthy tannic backbone. I was completely surprised after tasting these that Phillip told me they were crafted in neutral oak barrels. These wines ($45 for the Toulouse and Red Dog, $60 for the Oppenlander) deserve your attention, especially those of you who decry Pinot Noirs which reek of oak. 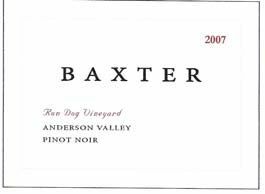 Contact Phillip at 707-877-3727 or phillip@baxterwinery.com to acquire these special wines. Phillip also is the winemaker for Jim Ball Wines in Anderson Valley. If you are a fan of the Kosta Browne style, check out the Pinot Noirs from Ketcham Estate, which in 2007 were crafted by Michael Browne. Ketcham Estate is a partnership between Steve Rigisich (left) and Mark Ketcham. The wines are sourced primarily from the 12-acre Ketcham Estate Vineyard located in the Russian River Valley just off Eastside Road. The vineyard is planted to several Dijon clones and Pommard clone. Scott Rich, noted winemaker at Talisman, will take over winemaking beginning with the 2008 vintage. The 2007 Ketcham Estate Russian River Valley bottling ($38) is 80% Ketcham Estate Vineyard and 20% O’Neel Vineyard. It is a prototypical Russian River Valley Pinot Noir aged in 30% new oak and showing the bright Bing cherry, spice and cola so typical of this region. The 2007 Ketcham Estate Reserve is a ramped up version of the same wine aged in 50% new oak and containing more Pommard clone. Both are excellent and recommended. The wines are sold through a mailing list (www.ketchamestate.com) with some retail distribution. 4. 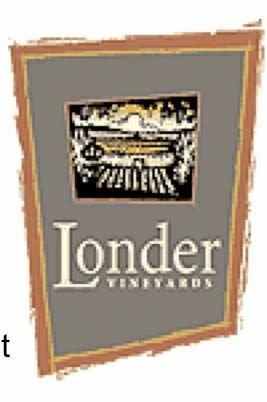 Londer Vineyards in the Anderson Valley is really hitting its stride. Like myself, founder Larry Londer (along with spouse, Shirlee) is a retired ophthalmologist. I know he has put his heart and soul into this winery and the wines reflect the commitment here. The winemaker is talented Richard Davis, who trained under Greg LaFollette for several years. The Londers have recently opened a tasting room on Highway 128 in Boonville. Three Pinot Noirs really impressed me: 2007 Ferrington Vineyard Anderson Valley (primarily Pommard, 228 cases, $50, lovely fruit, herbs, spice and remarkable persistence), 2007 Paraboll (591 cases, $54, Valley Foothills and Ferrrington vineyards, powerful with tannins to age), and 2006 Estate (490 cases, $48, now maturing with luscious fruit and very smooth tannins). The wines are sold primarily through a mailing list and online at www.londervineyards.com. 5. Benovia Winery has an exceptional winemaker, Michael Sullivan, who continues to craft remarkably good Chardonnays and Pinot Noirs (and Zinfandel) from estate and purchased fruit. A barrel sample of 2008 Benovia La Pommerraie Vineyard Pinot Noir was ready to go with a highly perfumed nose, smooth texture and hi-tone cherry fruit and was one of the most impressive wines I tasted at Pinot Days. I already was a fan of Benovia La Pommeraie Chardonnay from George Martinelli’s vineyard at the edge of Green Valley. Benovia wines are sold primarily through a mailing list at www.benoviawinery.com. 6. Jeff Fink, co-owner and winemaker at Tantara Winery, which is located at Bien Nacido Vineyard, always has an impressive lineup of Pinot Noirs to offer. Jeff is a no-BS kind of guy who is a familiar face proudly pouring at most major Pinot Noir events. I raved earlier in this feature about the half barrel of 100% whole cluster Pinot Noir from Solomon Hills Vineyard which was a striking wine in every way. The 2007 Brosseau Vineyard Pinot Noir (71 cases, $52) from the Chalone AVA was also very good. Made from the Mount Eden clone planted on a marginal site, wines from this vineyard are typically backward when young. This wine was surprisingly lush and open on the palate despite its flamboyant tannins and will match beautifully with hearty food. Tantara has a faithful mailing list following at www.tantarawinery.com. 7. Stephen Russell, the winemaker at Prodigal Wines in the Santa Rita Hills, was pouring some lovely Pinot Noirs. Stephen was an early (1960) graduate of the University of California at Davis enology program and was the first formally trained enologist to be hired by E. & J. Gallo. Frustrated by corporate winemaking, he left the industry, obtained a PhD and DVM degree, and had a successful career in cancer research. In 2001 the “prodigal son” returned to his roots, and with his wife, Mary, founded Quinta Santa Rosa Vineyard and Prodigal Wines in 2001. He has gradually taken over all the winemaking duties with the 2007 vintage. His style is all about restraint and elegance and I am a fan. He was pouring several Pinot Noirs. 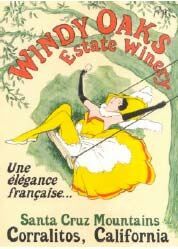 They were strikingly well crafted and very sensibly priced, all scheduled for April release but available at 10% off pre-release pricing including: 2007 Fiddlestix Vineyard (50 cases, $35), 2007 2 Vineyards 2A (50 cases, $45, clone 2A from Rancho la Viña at the western end of the Sta. Rita Hills AVA, and clone 2A from Rio Vista Vineyard at the eastern end of the AVA, alluring rose petal nose), and 2007 Estate-Grown (92 cases, $50, remarkable aromatics). Stephen is offering 33% off a purchase of one case or more (mention Pinot Days special). You won’t find better Pinot at these prices. 8. It was great to see Denise Selyem (photo) and Kirk Hubbard of WesMar Winery (pronounced “WesMare”) pouring their wines to a very enthusiastic response. I took a couple of my friends over to try their 2007 Sonoma Coast Pinot Noir (316 cases, $38) and they were blown away. At many wineries, the appellation blend is a poor sister to the vineyard designate wines but not so with this gem. A flat-out terrific wine for drinking now at a reasonable price. 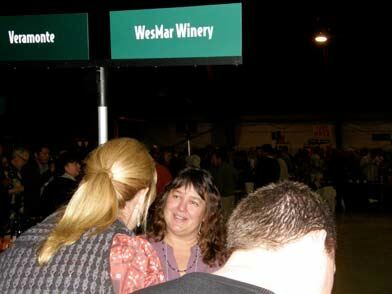 Don’t be put off by the WesMar website, www.wesmarwinery.com, as a new revision will be up soon. All the wines in their lineup are stellar (check out the huge scores in recent wine publications). 9. I find it disappointing and very poor judgment from a marketing standpoint when wineries fail to have their winemaker or owner at their station to pour their wines and answer questions. I had several attendees come to me to ask questions about wineries after they found that the pourers were woefully uninformed. The whole idea of these events is to connect with the winery principals and form that bond that makes the enjoyment of wine so much more intimate and satisfying. 10. Other wines that made an impression on me include: 2006 Belle Pente Vineyard & Winery (Willamette Valley) Murto Vineyard Pinot Noir, 2007 Inman Family Wines OGV Estate Russian River Valley Pinot Noir, 2007 Inman Family Wines Thorn Road Ranch Russian River Valley Pinot Noir, 2007 Kendric Vineyards Marin County Pinot Noir, 2007 Suacci Carciere Wines Russian River Valley Pinot Noir, and T.R. Elliott Three Plumes Hallberg Vineyard Green Valley-Russian River Valley Pinot Noir. 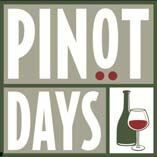 The PinotFile is a proud sponsor of Pinot Days. Future Pinot Days events include Pinot Days San Francisco (June 2010), Pinot Days Chicago (November 2010) and Pinot Days Southern California (January 2011). 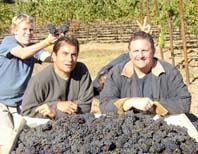 Check the website, www.pinotdays.com, for updates and the latest information on the Pinot Noir scene.